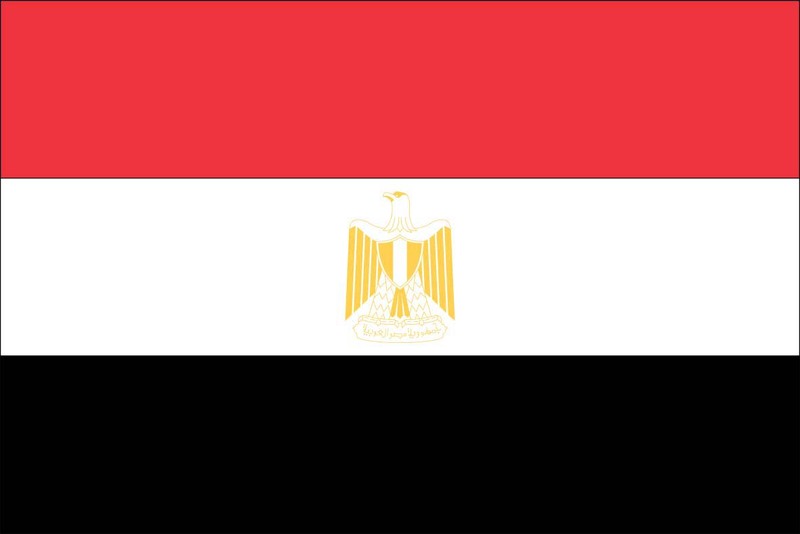 The flag of the Arab Republic of Egypt. Rising just one spot from 2014, the historic nation of Egypt comes out at 158 out of 180 with a score of 50.17 on the World Press Freedom Index by Reporters Without Borders. The previous rank is only solidified by Freedom House, giving Egypt’s overall freedom rating 5.5 out of 7, declaring the Arab nation “Not Free.” The country has maintained this rating for the majority of the past two decades, spiking in 2013 after the overthrow of President Mohamed Morsi where they reached even 5.0s across the board in freedoms, civil liberties, and political rights. Though Egypt obtained its nominal independence in the late nineteenth to early twentieth century, the continuing fight for the freedoms of its people can be shown throughout its vast history. Dating as far back as 5300 B.C., Egypt is known for its rich heritage, ancient architecture and diverse peoples. With one of the most documented histories known to man, the Egyptians are responsible for the pyramids, hieroglyphics and Rosetta Stone, and the infamous tales of the pharaohs. Egypt borders fellow Arab nations Israel and Saudi Arabia and rests alongside natural features such as the Sinai Peninsula and the Suez Canal. Cairo, Egypt’s capital, sits on the edge of the world’s longest river, the Nile, and is the largest city on the African continent, allowing the country’s population to reach just over 86 million people in 2015. Though Egypt has no declared state religion, around 90 percent of the Egyptian people are Muslim, and “Islamic principles guide the nation’s laws, business relations, and social customs.” Arabic is Egypt’s official language,4 and the country has been a member of the League of Arab States (or The Arab League) since its creation in 1945. Officially the Arab Republic of Egypt, the rule of the nation has passed through many different groups throughout its existence. Since the time of the pharaonic theocracy, Egypt has been ruled by the Persians, Alexander the Great and Ptolemy, Emperor Augustus (Octavian) of the Roman Empire, the Persians again, the Byzantines, the Shiite Islamic Fatimids, the Kurdish Ayyubids, the Turkish Mamluk (or Mameluke) oligarchy, the Ottoman Empire, joint French-British armies and, finally, a single British protectorate. When Egypt rose up against British occupancy in the Revolution of 1952, Egypt was ruled by Egyptians for the first time in over 2,000 years. Presently, similar to a parliamentary structure, the official Head of State lies with the president, the newly-elected Abdel Fattah el-Sisi, while the Head of Government lies with the Prime Minister, the Interim Prime Minister Ibrahim Mahlab until new elections are held in 2015. With the constant unrest and change, the people have been unable to secure basic “freedoms of assembly, association, expression, and press,” and minority groups feel they are not properly represented or protected,4 despite previous democratic efforts. Since Egypt’s declared independence, there has been much hardship. With two Israeli wars as well as an internal fight with organizations such as the Muslim Brotherhood and Egypt’s own military, the country’s history shows a lack of civil freedoms entirely. Even before modern civilization a pharaoh “was worshipped as a god and obeyed as one…All economic and political institutions were subject to royal control.” “There is much in Egyptian history and traditions that predisposes Egyptians to expect and accept authoritarian rule…Egyptian history teaches its readers that political stability in the country is best assured by a powerful, benign dictator.”9 Fast-forward to the nineteenth century when the pasha Mohammad Ali ruled under the Ottomans and history again shows that though “the people complained incessantly” at Ali’s demands, “they obeyed, for the pasha’s authority was absolute.”6 This concept can still be seen in the various Egyptian leaders as their legacy continued. The first sign after the 1952 revolution of the suppression of expression was that of Nasser’s imprisonment of any opposition to his system, including “old-regime politicians, Communists, Muslim Brothers, and other dissidents” in which “after 1954 there was no legal opposition to Nasir’s rule.” Though this campaign surfaced following a failed assassination attempt on Nasser’s life, the abuse of Egypt’s government for his “vendetta” was “among his least popular policies.”8 In his later years, he placed restrictions and government watch over student unions, only allowing petitions and demonstrations if they were authorized, in other words, if they fit Nasser’s liking. “When the Cairo and Alexandria University students demonstrated in response, [it caused] numerous arrests and injuries.” Nasser followed by promising to liberalize the Egyptian political system thereby giving students a larger voice; however, this did not happen.8 Worldly concerns were on forming the peace between Egypt and Israel at this time, and outside influence was nearly absent in the fight for Egyptian rights. Following Nasser’s death, Vice President Sadat took charge of Egypt. Between the years of 1972-1973, Sadat took extra measures to combat the “country’s falling morale,” enforcing new law that placed severe censorship on books and periodicals and imposed severe punishments for “rumormongers, and many writers [who] were jailed on falsified charges.” University students protested the draft, and engaged in sit-ins such as the one in Libertarian Square, while a “group of older mothers held a mass protest in Ezbekiyya Gardens.” It was during these demonstrations where landmarks like the Cairo Opera House and Mehmet Ali’s palace were destroyed by raging fires.8 Though organizations such as the Muslim Brothers were no longer banned, Sadat showed little patience towards enemies of his trade. “The regime, during Sadat’s last years and throughout Mubarak’s containment, confrontation and coercion had low tolerance of dissidents and dissenters.” Again, like during Nasser’s reign, these issues were dealt with using government and political restrictions on the people of Egypt, and foreign nations focused on warfare. As economic conditions improved after the Camp David Treaty, “the liberal regime that had been promised did lift censorship from mass media for a while, but it was once again restored to suppress any criticism of the president and his actions.” When criticisms came from his cabinet or military office regarding him or his family, Sadat passed “a law making it a crime to attack his policies or those of his close associates,”7 even going as far as creating a “Law of Shame,” which made it illegal to express disapproval of government affairs while out of the country. This law ultimately resulted in the arrest of 1,500 people, just a few among the said 15,000 names.7 Though Sadat was eventually assassinated, this unrest and opposition only continued through Vice President Mubarak’s regime. Since Mubarak’s demise, the Egyptian people elected and yet again overthrew another president, Mohamed Morsi in 2012, and new laws are in place to restrict public protest.10 In the most recent events, under the new regime of democratically elected Abdel Fatah al-Sisi, nearly 16,000 of his political opponents are imprisoned, the April 6th Youth Movement and the Tahrir Square Protest (both in memory of the lives lost in the overthrow of Mubarak in 2011) have been banned, many activists and journalists have been jailed, and 683 Muslim Brotherhood supporters were death-sentenced in one fell swoop. Despite this oppression, the government encouraged the new involvement and use of the internet in Egypt, and allowed its citizens to view certain media outlets, some foreign, and other from government owned and run stations. This sparked hope in the nation, as journalists began to cross “red-lines,” even though the government never ceased its attempt to suppress them.20 These advancements were halted however, when government restrictions increased prior to the 2011 parliamentary elections in an effort to silence independent thinkers, “filing spurious charges, harassing and arresting journalists and bloggers, and violating due process.” The Revolution of 2011 followed, ending Mubarak’s dictatorship. Though the Muslim Brotherhood intimidated many during Morsi’s single year, outlawing and suppressing any anti-Morsi campaign, “beginning the minutes after seizing control, and then over the days and weeks since, the Egyptian military imposed widespread censorship against pro-Morsi news media and obstructed coverage supportive of the Muslim Brotherhood and the toppled president.”22 Throughout each regime the Egyptian government not only turned a blind-eye to its own constitutional rights, but almost completely contradicted the predeceasing government, creating a teeter-totter of political injustice and societal unrest. A year prior the citizens of Egypt were warned not to express any anti-Morsi sentiments, yet mere moments after his oust, they were then prevented from expressing pro-Morsi or Muslim Brotherhood opinions, each instance ignoring the human right to free speech and press despite the foundations stated in their own constitutional articles. Though the United States and the Arab Republic of Egypt both reserve the rights for its citizens to have freedom of speech and press in their constitutions, the ways in which each country upholds these rights is drastically different. Article (65) Freedom of thought and opinion is guaranteed. Every person shall have the right to express his/her opinion verbally, in writing, through imagery, or by any other means of expression and publication. Article (70) Freedom of the press, printing and paper, visual, audio and electronic publication is guaranteed. Every Egyptian – whether being natural or legal, public or private person – shall have the right to own and issue newspapers and establish visual, audio and digital media outlets. Newspapers may be issued once notification is given as regulated by Law. The Law shall regulate the procedures of establishing and owning visual and radio broadcast stations and online newspapers. Article (71) It is prohibited to censor, confiscate, suspend or shut down Egyptian newspapers and media outlets in any way. By way of exception, they may be subject to limited censorship in times of war or general mobilization. No freedom restricting penalty shall be imposed for publication or publicity crimes. As for crimes related to the incitement of violence, discrimination between citizens, or impingement of individual honor, the Law shall stipulate the penalties therefor. As shown through Egypt’s recent political history, their many leaders, even despite the newly drafted democratic constitution, have ignored the articles above. The United States Constitution offers similar articles in the First Amendment and Bill of Rights to the Constitution, and the court has vigorously continued to insure its complete installment throughout the constitution’s 226 year existence. On the matters of free speech and press, several cases have shown favor for journalists in the U.S., such as New York Times v. United States or the “Pentagon Papers Case” in which “the Nixon Administration attempted to prevent the New York Times and Washington Post from publishing materials belonging to a classified Defense Department study regarding history of United States activities in Vietnam.” In favor of the newspaper companies, the Supreme Court ruled that the government could not inflict prior restraint to prevent publication. In Egypt, media outlets such as the Al-Bernameg were shut down due to anti-government remarks, and many publications since 2013 have been shut down indefinitely. On the matter of expressing anti-government sentiment publically, the United States Supreme Court ruled against a left-wing socialist in Gitlow v. New York, in which, after the publication and distribution of an anti-government manifesto, resulted in Gitlow’s censorship. However, Justice Oliver Wendell Holmes left a dissenting opinion that would ultimately be adopted by the U.S. Supreme Court within 50 years. Arguing that Gitlow showed no clear and present danger, Justice Holmes stated that “if, in the long run, the beliefs expressed in proletarian dictatorship are destined to be accepted by the dominant forces of the community, the only meaning of free speech is that they should be given their chance and have their way.” If Gitlow’s words were taken seriously by the nation, then it would be the decision of the people as a majority to adopt them, therein alongside democratic standards as stated in the U.S. Constitution. Again, despite the written articles of the new constitution of 2014, Egyptians are not truly given the ability to criticize the government, especially publicly. This is usually prohibited by government and the presidentially controlled military, claiming the oppression as the well-being of the nation under the emergency clause. In the United States case Snyder v. Phelps, further protection for protesters was established, in which the Westboro Baptist Church in Topeka, Kansas, peacefully protested the funeral of a United States soldier. The Supreme Court ruled their protest was protected under the First Amendment right to symbolic speech and expression, even near the funeral of a military soldier. In Egypt, again despite the constitutional mandates, the act of protesting is still illegal, usually under the governmental clause that it enacts violence and defames the reputation of the government. Underneath these claims, it is the façade to prevent, yet again, anti-government sentiments, even if the protest is peaceful such as the incident of Shaimaa al-Sabbagh and other members of various human rights groups still yet to be determined. Though these comparisons are only few in the many one could make for incongruities between the United States and Egyptian governments, these alone strongly support the evolution in freedom that the United States has taken, and how far Egypt still needs to go in order to be considered in the same ranks of freedom as the United States. Though Egypt’s multi-thousand-year existence far exceeds that of the United States’ few-hundred years, the Egyptian’s journey is just beginning toward its true democratic society – one that will hopefully defend the birthrights of its ever-growing people. “2015 World Press Freedom Index.” 2015 World Press Freedom Index. N.p., n.d. Web. 11 Apr. 2015. “Freedom in the World 2015 | Egypt.” Freedom House. N.p., n.d. Web. 11 Apr. 2015. Shaw, Ian J. The Oxford History of Ancient Egypt / Ed. by Ian Shaw. New York: Oxford UP, 2000. Print. “The Arab League.” Council on Foreign Relations. Council on Foreign Relations, 21 Oct. 2014. Web. 12 Apr. 2015. Thompson, Jason. A History of Egypt: From Earliest times to the Present. Cairo, Egypt: American U in Cairo, 2008. Print. Sayyid-Marsot, Afaf Lutfi. A Short History of Modern Egypt. Cambridge: Cambridge UP, 1985. Print. Goldschmidt, Arthur. Modern Egypt: The Formation of a Nation-state. Boulder, CO: Westview, 2004. Print. Osman, Tarek. Egypt on the Brink: From Nasser to Mubarak. New Haven: Yale UP, 2010. Print. “Egypt Profile – Timeline.” BBC News. N.p., n.d. Web. 13 Apr. 2015. Greenwood, Pheobe, and Laurence Topham. “Who Is Abdel Fatah Al-Sisi? – Video.” The Guardian. The Guardian, 3 June 2014. Web. Kingsley, Patrick. “Female Protester’s Death Prompts Rare Condemnation in Egyptian State Media.” The Guardian. The Guardian, 26 Jan. 2015. Web. 13 Apr. 2015. “Video Shows Police Shot Shaimaa Al-Sabbagh.” YouTube. Humans Rights Watch, 21 Jan. 2015. Web. 13 Apr. 2015. “Continuous Targeting of Human Rights Defenders in Egypt; Witnesses Become Defendants.” Continuous Targeting of Human Rights Defenders in Egypt; Witnesses Become Defendants. Cairo Institute for Human Rights Studies, 28 Mar. 2015. Web. 13 Apr. 2015. Sayah, Reza, and Mohammed Tawfeeq. “Egypt Passes a New Constitution – CNN.com.” CNN. Cable News Network, 18 Jan. 2014. Web. 13 Apr. 2015. “Constitution of the Arab Republic of Egypt.” Arab Law Quarterly 7.4 (1992): 251-71. Egyptian State Information Service. 18 Jan. 2014. Web. 13 Apr. 2015. “The Universal Declaration of Human Rights, UDHR, Declaration of Human Rights, Human Rights Declaration, Human Rights Charter, The Un and Human Rights.” UN News Center. UN, n.d. Web. 13 Apr. 2015. “Freedom of the Press 2002 | Egypt.” Freedom House. N.p., n.d. Web. 13 Apr. 2015. “Freedom of the Press 2008 | Egpyt.” Freedom House. N.p., n.d. Web. 13 Apr. 2015. “Freedom of the Press 2011 | Egypt.” Freedom House. N.p., n.d. Web. 13 Apr. 2015. Mansour, Sherif. “On the Divide: Press Freedom at Risk in Egypt.” Committee to Protect Journalists. N.p., 14 Aug. 2013. Web. 13 Apr. 2015. “Freedom of the Press 2014 | Egypt.” Freedom House. N.p., n.d. Web. 13 Apr. 2015. “Fact-Based, In-Depth News | Al Jazeera America.” Fact-Based, In-Depth News | Al Jazeera America. N.p., n.d. Web. 13 Apr. 2015. Greenslade, Roy. “Al-Jazeera Jailings: Egypt Has Taken Three Innocent Journalists Hostage.” The Guardian. The Guardian, 23 June 2014. Web. 13 Apr. 2015. Associated Press. “Egyptian Journalists Oppose Editors over Freedom of Expression.” The Guardian. The Guardian, 2 Nov. 2014. Web. 14 Apr. 2015. Kingsley, Patrick. “Al-Jazeera Journalists Jailed for Seven Years in Egypt.” The Guardian. The Guardian, 23 June 2014. Web. 14 Apr. 2015. Michael, Maggie. “2 Al-Jazeera Journalists Reunited with Families after More than a Year in Egyptian Prison.” US News. U.S.News & World Report, 13 Feb. 2015. Web. 14 Apr. 2015. Elshinnawi, Mohamed. “Media Restrictions, Other Free Speech Issues Remain in Egypt.” Voice of America. Voice of America, 15 Nov. 2014. Web. 14 Apr. 2015. NEW YORK TIMES v. UNITED STATES. The Oyez Project at IIT Chicago-Kent College of Law. 14 April 2015. Gallien, Max. “Egypt: the show is over.” Free Speech Debate. University of Oxford, 10 June 2014. Web. 14 Apr. 2015. GITLOW v. NEW YORK. The Oyez Project at IIT Chicago-Kent College of Law. 14 April 2015. SNYDER v. PHELPS. The Oyez Project at IIT Chicago-Kent College of Law. 13 April 2015. “Meaning of Egypt Flag.” Meaning of Egypt Flag. N.p., n.d. Web. 28 Apr. 2015. This essay was last updated April 30, 2015.